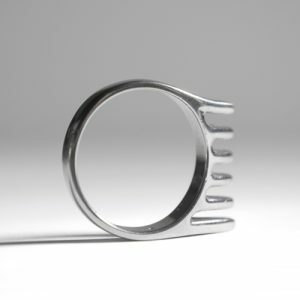 Vézzo - The original beard combing ring - How was it born? Mr. VelloBello has a beard himself, and, as many of his friends, more or less contemplative, he has the habit of caressing it, as if this gesture could help him put his thoughts in order. But Vézzo is conceived also as a small present, an object for those who like to have their beard grow. Because, remember, the true question is: “why do you cut your beard? “ and not “why do you let your beard grow?”. From here, lots of reflections around look and comfort, trends and habits could arise…but, nowadays, as a matter of fact, beard is back to be a protagonist. Hi! Tell us how you got the idea for Vézzo. Hi! To start with, I tell you that I am an atypical creative, because I like to create useful objects, get my hands dirty by working with materials and give shape to peculiar products. On top of this, I have to specify that I have been having a beard for many years…and I realized that I often caress it, because it helps me get concentrated. It is an automatic gesture that has no specific reasons to be. Suddenly, I decided to give my beard a present. 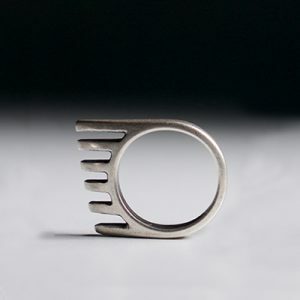 I thought about an object, in between a ring and a comb, some sort of connection between my hand and my chin…in other words, a way to give meaning to this habit that is common among many of my friends and I. How did you choose shape and materials? First of all, I looked for a primordial shape, a design that could remind me of objects from ancient cultures: jewels, small tools, and objects from the Iron Age that, in their simplicity, show an atavistic charm. Clearly, I redesigned proportions and thicknesses and started to work on the first silver prototypes, before moving to the final mould. 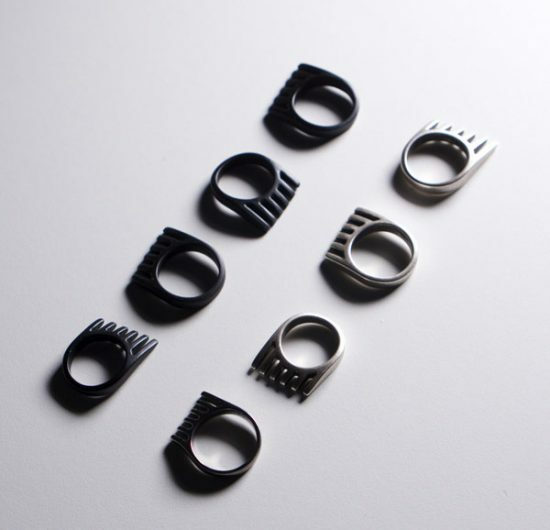 The ring is now available in three finishing: silver galvanic bath zamak, black powder painted zamak and, on demand, silver with different finishing. Has it been a difficult path? 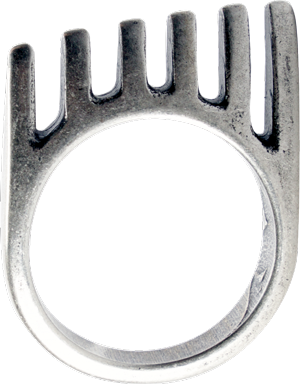 I would say no, because, since the beginning, I had clear in my head the idea of a stylised hand that recalled the teeth of a comb, but also the paw of a bear. It took me a while to determne the final shape, and the name, as a consequence. I wore the ring a lot before deciding how to name it…at the end it became my habit….my Vézzo! Production, distribution and sale of this product and its variations according to the Registered Community Design RCD 3789676-0001 are of exclusive usage of their owners and licensees. Therefore, production, distribution and sale of this product and its variations are forbidden to third parties without the authorisation of the owner.